Home » Kevin Spacey , Netflix » Should "Gore" be Cancelled Just to Spite Kevin Spacey? Should "Gore" be Cancelled Just to Spite Kevin Spacey? 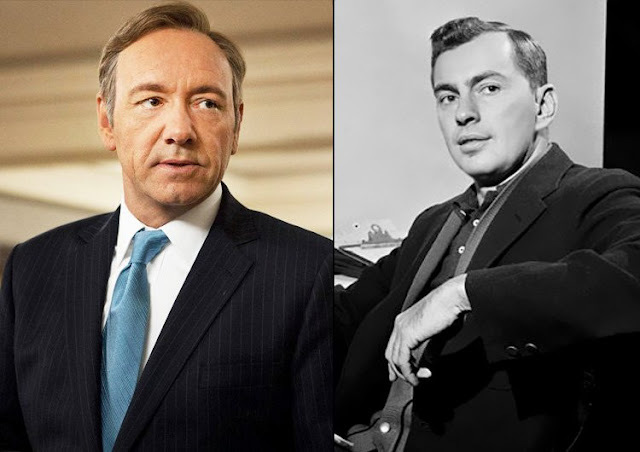 For those who are about to write me e-mails or comments about the title above, I want to make it clear that I AM aware of the fact that Netflix has cancelled "Gore," the biopic about Gore Vidal that was to star and be produced by the now disgraced Kevin Spacey! Certainly people are not happy with the man (for good reason) and it is pretty easy to understand that many do no want to see him in a movie at the moment. Spacey was also fired from "House of Cards," but that sixth season had only begun filming, and there is time to re-write the season, make Claire Underwood (Robin Wright) the star of the show, and do something akin to what Warner Bros. had to do when Charlie Sheen became too much to handle on "Two and a Half Men." I don't like either scenario. I don't like that these things happen without substantial proof or that as a society we are willing to kill careers. What's more though is I hate it when stuff gets buried and people lose jobs just because we don't like a guy. In the last article I wrote a couple people got into a debate on the Facebook comments section. One felt it was wrong that people have their entire careers ruined because of some allegations that may or may not be true. Another person felt that Spacey's initial response was a round about admission of guilt, and that if a few shows getting cancelled was what was needed to send a message, then so be it. Both agreed that if the allegations were true, the man deserved everything that was coming to him. For me, the re-writing of he final season of "House of Cards" hurts, but they have good writers on staff, and they will likely be able to work a miracle into their scripts. "Gore," on the other hand, was cancelled outright. Here's the thing though: the movie was practically finished. All the key footage had been shot. The editing was nearly finished. Music would likely need to be added, but for all intents and purposes the movie was complete. Now, it appears, that work will never make it out. And that is a shame for a couple reasons. I've written about how I believe the art and artist should be separated and this is a movie I actually wanted to see. If you think Kevin Spacey can't be compelling in a political movie even after the allegations, go watch "Recount" and come back and tell me if you don't think that's a great performance. If the movie had been in the early stages Netflix may have had more of a leg to stand on. But a nearly finished movie that needed at most a couple more million dollars to finish? Isn't that like baking a blue cake and finding out more people prefer red cakes and just scrapping it when all that's left to do is add the frosting? Sure, there's a chance no one will buy it. On the other hand, so many people go in the store there's a chance the blue doesn't bother them, and they may buy it anyway. "Gore" was a movie about a popular political figure during a trying time in his life. Even with Kevin Spacey as the lead, chances are someone would have watched it. Someone watching it is enough to justify finishing the movie and at least sitting on it for a couple of years. Right now everyone is sensitive about what has happened, but in five years maybe it won't matter. Maybe in a few years people will have moved on and Netflix would have had a perfectly good movie to sell people? At the very least it would show that all that work and money didn't go to waste (like it currently is as it stands). There's also something else we need to discuss, and the main reason I titled the article the way I did: is it worth hurting EVERYONE just to spite Kevin Spacey! Let me explain: it is clear that people want Spacey punished. They want him to make less money. By finishing the "Gore" movie and keeping him in "House of Cards" you would be keeping him in the national spotlight (though it sounds like it might be his last hurrah). Thankfully for Netflix, "House of Cards" could be retooled. But "Gore"...it just got dropped altogether. And, yes, technically this does hurt Spacey and send him a message. On the other hand, what about the people who were working on the movie? The people who had jobs for post-production who are no longer getting paid? The actors who had their first speaking lines who were banking on this movie to be released so they could join the Screen Actors Guild? The writers, producers, sound people, and extras who were depending on residual checks that would be coming in from the movie making money for years to come? The thing is, this isn't the first time Netflix has done something like this. They funded (and completed) a comedy special called "Bill Cosby 77." It was a stand up (or, sit down) comedy movie where the former beloved comedian made jokes about getting old, his life in the business, and whatever else came to mind. Sexual assault allegations popped up for him and Netflix shelved the movie even though it was finished. We still have not seen the movie, though I hope one day we do. There are many people who worked on it. People whose careers got delayed or killed because it wouldn't come out. Yes, Cosby suffered from the film being shelved, but hundreds of others who worked on it got taken down as well. We're going through this again with "Gore" now, and even though the film just needs a few minor touches to be watchable, there's no guarantee that Netflix will even let the director shop it to another studio (I'm sure an independent theater would kill to have a multi-million dollar film with an Academy Award-winning star in their library for pennies on the dollar). Now the people who worked hard on that film have nothing to show for it. They currently have no future checks coming in the mail. All for a movie that, from all accounts, is good and fine. So the question needs to be asked: is it worth hurting all of those people just to get back at Kevin Spacey? I can understand not wanting to work with the guy in the future. While I wish it weren't so (purely from an art standpoint) his career is effectively over, and we're just going to have to accept that. However shelving finished movies and cancelling shows that employee hundreds of people as a result of one person seems far more unjust to me than putting up with the man until we at least have some evidence that he did what people have claimed he did. On a final note I want to mention that all subsequent allegations have been anonymous. In my eyes, if the accuser has no evidence and doesn't even want you to know who they are, they have no case, and I am disturbed that we can so easily drag someones reputation through the mud for people who don't want to be known themselves. That is another matter for another day though.